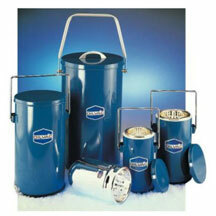 A cryogen is a substance used to produce very low temperatures. A synonym is "refrigerant". Cryogenics is the study or production of very low temperatures. You can get metal-cased Dewars like these from Safety Emporium. Examples of common cryogens include liquid nitrogen which has a boiling point of 77 Kelvin (-196 °C = -321 °F), liquid helium (b.p. 4.2 K = -270 °C = -450 °F), and carbon dioxide (a solid that converts directly to gas at 195 K (-78 °C = -109 °F). Cryogens can be pure substances or mixtures of different substances. For example, chemists will often use a slush bath made of acetone and solid carbon dioxide to maintain a temperature of -78 °C. Handling of cryogens requires special equipment and training. Liquid cyrogens such as liquid nitrogen are stored in special vacuum-jacketed vessels called Dewar flasks (named after the first person to liquify helium, James Dewar) which are essentially fancy versions of a common Thermos® flask. These have have a loose-fitting cap to vent the evolved gases while preventing air and moisture from entering. 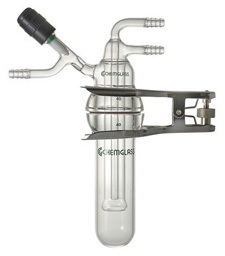 While Dewar flasks can be made out of steel or plastic, common laboratory ones are usually made of silvered glass. When glass Dewars are dropped or treated roughly, they tend to implode with a loud bang, so most laboratory Dewars are enshrouded in a plastic mesh, aluminum jacket, or tape to contain shrapnel. Frostbite - Liquid nitrogen freezes human tissues within seconds, a behavior exploited by dermatologists to remove warts and other cosmetic blemishes. Brief exposure to liquid nitrogen can cause painful blistering. Frostbite can occur quickly, especially if the liquid nitrogen saturates your clothing or gloves. Therefore, splash goggles, non-porous aprons and insulated gloves which can be quickly removed are always recommended when handling liquid or solid cryogenic substances. In the event of contact with cryogens, use appropriate first aid procedures such as warming the affected areas with lukewarm (never use hot) water. Seek medical assistance for severe cases. Asphyxiation - Small amounts of liquid cryogen expand into very large volumes of gas, displacing oxygen. If gas is formed in an unventilated enclosed area, death or coma from oxygen deficiency can result. Do not enter an oxygen deficient area, even to rescue someone. The vapors are generally heavier than air, so stairwells and basements can be particularly hazardous. Pressure Explosion - Cryogens are at their boiling point or sublimation point which means that they are rapidly converting from liquid or solid into large volumes of (invisible) gas. NEVER STORE CRYOGENS IN A SEALED CONTAINER. See the carbon dioxide entry for more on this topic. Fire and Explosion - While nitrogen is a non-flammable inert substance, some cryogens, such as hydrogen are flammable. See liquid oxygen, next. Liquid oxygen - If a constant stream of air is pulled through a vacuum trap cooled with liquid nitrogen, liquid oxygen may condense in the trap (see item 1b above!). Liquid oxygen is exceedingly dangerous and reacts violently with most organic substances, including Teflon® tape, vacuum grease, and organic solvents. If you are ever working with a laboratory vacuum line and find a pale blue liquid in your trap, immediately replace the trap and back away. Consult your supervisor IMMEDIATELY. Warn others of the danger, posting signs if necessary. "Safety in the Handling of Cryogenic Fluids (International Cryogenics Monograph Series)", Hardcover, 228 pages, 1996. Estimated price $160.00. Info and/or order. "Cryogenic Technology and Applications", Hardcover, 296 pages, 2005. Estimated price $37.77. Info and/or order. "The Art of Cryogenics: Low-Temperature Experimental Techniques", Hardcover, 378 pages, 2007. Estimated price $270.00. Info and/or order. "Cryogenic Freezing Manual", Hardcover, 216 pages, 2008. Estimated price $68.00. Info and/or order. You can get cryogenic sublimators and related equipment from Safety Emporium. The MSDS for a cryogenic substance should list the hazards and proper personal protective equipment to use. Goggles and gloves should be worn when handling cryogens. Always keep cryogens in approved containers and in well-ventilated areas. Read the hazards listed above and make sure you have taken the proper precautions for each. When warm (room temperature is warm compared to a cryogen, remember) objects are placed in a cryogen bath, the cryogen will immediately boil rapidly and vigorously, producing significant amounts of vapor, fog, and splashing. Do not place Dewars (especially glass ones) in places where they could be knocked or dropped. If you live in an earthquake-prone area such as California, you may need to install lips on shelves or strap your Dewars down. How Do I Work Safely With Cryogenic Liquids at the Canadian Centre for Occupational Health and Safety. Cryogenics Safety Manual at Argonne National Laboratory. Cryogenics Materials Safety Fact Sheet at the U of Kentucky. Cryogenic Safety at the U of Louisville. General Cryogenic Safety Training, a PowerPoint presentation from Fermilab. Liquid Nitrogen Dewar Installation and Operation Rules for large storage dewars at Fermilab (MS Word format). See also: air, asphyxiant, carbon dioxide, inert, pressure units, temperature units.